A few days ago a relative new contributor to the Perl 6 test suite apologized for the perceived bad quality of his commits to the test suite. (There was no reason, the commits were actually quite good). It made me think about the quality of what I contribute there. It's not easy to assess the quality of tests. We want to keep the test suite as simple as possible, in the sense that every test should test one specific piece of Perl 6, and use simplest syntax otherwise. That means we have trade offs regarding code duplication: Not using fancy data driven testing often results in multiple test that look similar - something you'd avoid in normal programs, and even in normal test suites. 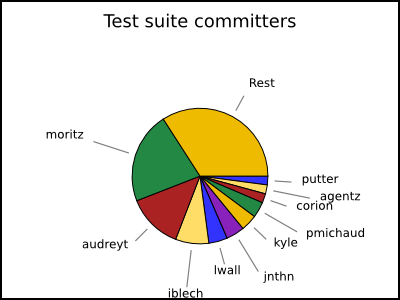 ... and considering the fact that I contributed about 20% of the commits to the test suite (number from 2009-10-10), at least half of what I contributed was crud too. I'm not ashamed of it - as long as I strive for good code and do my best, everything is fine. And I encourage those who think their tests are crud to commit them anyway - or at least ask for review. Those who are concerned about their code quality usually produce quite decent code. See also: Matt S Trout - You are not good enough.